NYC, 05/29/2019, 2:00PM. 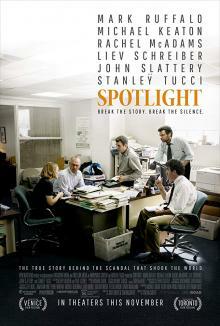 Spotlight (2015): Two Time Oscar Winning Story Of The Boston Globe. 129 min. Director: Tom McCarthy. Starring Mark Ruffalo, Michael Keaton, Rachel McAdams. Spotlight won the Academy Award for Best Picture, along with Best Original Screenplay, from six total nominations. Spotlight grossed $45.1 million in the United States and Canada and $53.2 million in other countries for a worldwide total of $98.3 million, against a production budget of $20 million.